70 Birch Alley Suite 240 Building B Beavercreek OH 45440. At Aurora Serenity Center, we provide you with the tools you need to defeat addiction. Don’t struggle for another day! Contact us now and we’ll get you on the road to recovery. 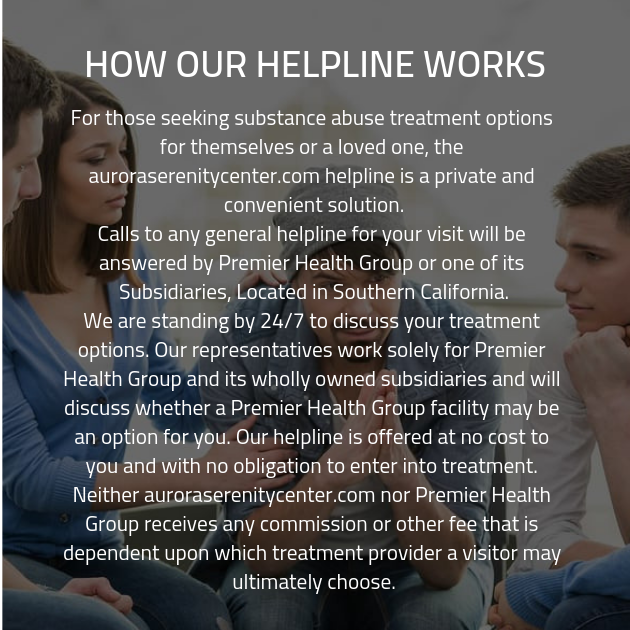 At Aurora Serenity Center, we pride ourselves on the broad spectrum of services we are able to provide to clients at our substance abuse treatment center. With both traditional therapeutic options and cutting-edge holistic options, as well, we are ready to provide the help that our clients need to finally defeat their addiction. While your addiction recovery plan will never look like anyone else’s thanks to our efforts to customize treatment, there is a menu of possible options for our clients. However, there are some elements of treatment that tend to span across the addiction recovery plans of various clients. One of these is supervised detoxification. Detoxing can be very difficult when don alone. This is why it is of the utmost importance that you elect to go through the detox process in a drug rehab clinic, where you can be assured that you are in a safe environment as you overcome this challenging process. During individual therapy, you’ll meet with your addiction counsellor on a one-on-one basis. This will allow you to speak frankly and at length about any personal concerns or thoughts you have as you work your way through recovery. It comes into play when a client has not only an addiction, but also a co-occurring mental health disorder. Because of the nature of these co-occurring disorders, some clients might not even realize that they are struggling with it.